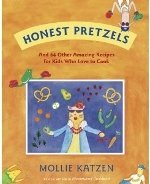 Have you been searching for Kids Sandwich Cookbooks? Well here's a list of some that I've found. You'll find easy recipes that are just as fun to make as they are to eat! Hope you enjoyed the list and found a delicious sandwich recipe in the process. If you know of any kids cookbooks that have sandwich recipes that we don't have listed here, add them using the form below. You can also use the form to tell us what you liked about the cookbooks. If you want more Fun Sandwich Books, click here.